Disclosure: I received a sample to facilitate this post. All opinions are my own. This post contains affiliate links. I’m a huge fan of Suzanne Somers. Yes, I loved her show, Three’s Company, but that’s not what made me love her so much. Suzanne’s books helped me lose 70 lbs after the birth of my second daughter. I followed her “Somersizing” diet and it worked great for. So whatever Suzanne is selling, I’m buying including her new subscription box, SUZANNE Selects! SUZANNE Selects Subscription Box is a monthly box filled with surprise SUZANNE full-sized products valued at least $125. The cool part is that you only pay $39.99/month. If you are a regular reader of this blog, you’ll already know that I’m a huge fan of subscription boxes. I think I subscribe to around 5 or 6? Anyways, I wanted to see what SUZANNE Selects was all about and so far, I’m impressed! Suzanne hand-selects all the products for the subscription boxes each month. The box I received was the “Transformation Kit” with products from her amazing SUZANNE Organics line. She says these four products are ones she couldn’t live without. 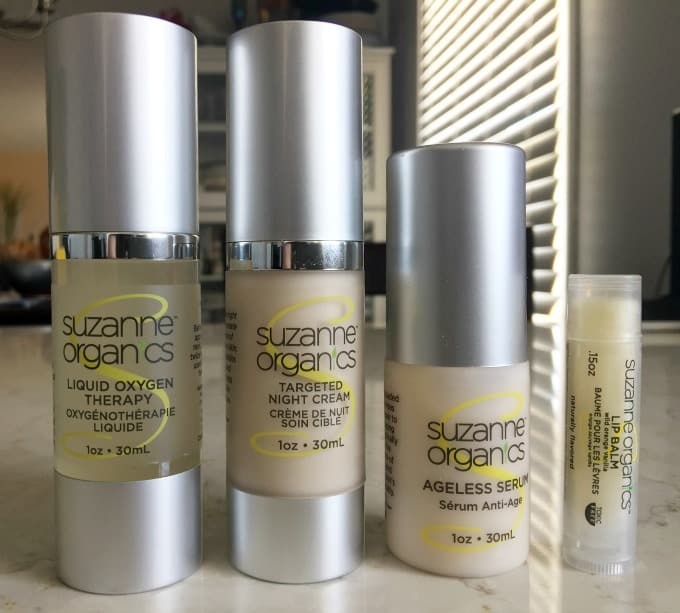 Here’s a look at each of the SUZANNE Organics products inside. Ageless Serum (ARV $34.99). Suzanne’s most popular anti-aging serum that plumps, firms and restores elasticity. It smells nice and it glides on my skin leaving it soft, supple and glowing. Liquid Oxygen Therapy (ARV $54.99). Your spa-in-a-bottle for an at-home oxygen facial. This product is my favourite of the bunch! It hydrates my skin and gets rid of the redness. Targeted Night Cream (ARV $49.99). Wear this cream nightly and let its powerful anti-oxidants work their magic on your skin. Now that I’m 40, I’ve been looking for a good moisturizer. Wild Orange Vanilla Lip Balm ($9.99). My lips thank you, Suzanne! Not only does this lip balm smell delicious (think creamsicles), but it makes my lips feel so soft and moisturized for the day. The value is fantastic! I can’t believe you get all this for only $39.99! To buy them all separately, it would cost you $149.96. Another bonus is that all these products are organic and Certified ToxicFree®. You can also choose to have your box shipped every month, every other month or every three months. I can’t wait to see what the next boxes will include! Remember, each month is a surprise! With Mother’s Day coming up soon, SUZANNE Selects would make a lovely, thoughtful gift. My mom was eyeing up my box when she was here for a visit. Do you know anyone who would love this subscription box? I am a sucker for subscription boxes – i love the element of surprise on my doorstep each month – and this one sounds like one I’d love! I love trying new products!